EDIT: I am going to include some screenshots so that what I am seeing is clearer. In this thread, these are the options I am seeing (under Iceweasel 20.0) beneath the question, my answer, and the subsequent answer. In this thread, these are the options I am seeing beneath the question (i.e., the same as the question linked above) and the related answer (i.e., the same as the second answer). It appears all new answers no longer appear to offer a "flag offensive" option. @David suggests in a comment below that the variation may be due to karma settings. The lack of a "flag offensive" option makes SPAM reporting impossible more tedious as we now have to use the close link and corresponding Reasons field as indicated below by @mariosv. It also appears to be impossible to flag a user for spamming, which would be even more useful. The option against answers appears to have been removed in only the last couple of weeks. I can see the "flag offensive" option in all (new) answers (current Firefox, SeaMonkey) – apparently visible only with moderator status. This is a bug in Askbot 0.7.48 and is fixed in 0.7.49 which we will get eventually. Good to know it was a temporary blip! @David – Thanks for the clarification. Hi @oweng, it is an option in Xclose. ... and where is Xclose? @L-user - under the post (http://i.imgur.com/C96paDv.jpg) - do options here depend on "karma" levels? @mariosv, I do not get any option offered to me when I click the "X close" link. Clicking "X close" simply deletes the related answer. I raised this question because I have resorted to deleting (rather than flagging) answers that appear to be SPAM, which then leaves the spamming user account. @mariosv, please ignore my previous comment above this one. I was confusing the "delete" link with the "close" link. Using "close" is not an ideal solution, but I will consider this a workaround for now. Thanks. FWIW, I miss the "flag", too. It did a job that the new (?) setup seems not to include. I am completely confused by this AskLO issue. In this thread I can now see a "flag offensive" option against my answer, but not the initial question. It must be related to some karma+badges combination. I am starting to develop some concerns about this site. The original forum is much easier to deal with. As a newbie, I just have to say this format is totally confusing. If you try to follow the thread you have to scroll up and down and it still sometimes doesn't make sense. Could somebody tell me what this interface is called? Is it still a forum or does it have a specific name? 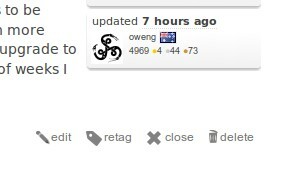 I know this is a little off topic but I agree with oweng - the original forum is much easier to deal with. Thanks for linking to it - I wouldn't have known it existed.